Although there is no known cure for fibromyalgia, there are treatments available which can alleviate symptoms and help you lead a better, more productive life. At Accident & Pain Relief of St. Louis, our chiropractors focus on non-drug, noninvasive techniques of relieving fibromyalgia pain, including physical therapy, chiropractic care, and acupuncture. These treatments have proven to be successful for reducing pain in our St. Louis patients with fibromyalgia syndrome (FMS). FMS is a chronic pain condition characterized by widespread musculoskeletal pain and fatigue. It affects women more than men, and it estimated to afflict 3-6% of Americans. An exact cause of fibromyalgia has not been identified. Currently researchers believe FMS may be related to an over-sensitization of nerve cells; an imbalance in brain chemistry; and a disruption of the deep phases of sleep which inhibits the proper release of hormones. Some patients experience fibromyalgia after a traumatic incident, such as a car accident, fall, or injury. Others develop the condition over time, without a specific time of onset. Chiropractic adjustments can reduce musculoskeletal symptoms frequently experienced by patients with fibromyalgia, such as back pain, neck pain, and myofascial (muscle) pain. Over time, patients with fibromyalgia begin to develop trigger points, or hyperirritable spots of pain located deep within taut bands of muscle fibers. (Trigger points should not be confused with tender points). Chiropractic care, along with acupuncture and massage, can break up these fibrous adhesions to allow the damaged tissues to heal. 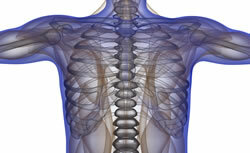 Chiropractic adjustments can correct any dysfunction within the spine or joints to improve mobility and overall function. Studies have shown that chiropractic adjustments can reduce pain intensity and fatigue in patients with fibromyalgia, in addition to improving sleep quality. Regular exercise and physical therapy can reduce stiffness, fatigue, and muscle pain. Our St. Louis chiropractors are also licensed physical therapists who can design rehabilitative programs specific for your fibromyalgia symptoms. While we do physical therapy work in the office, you'll also learn new stretching and strengthening exercises to perform at home, so you can begin to develop new healthy habits on your own. Physical therapy may also include deep tissue massage as well as ice and heat packs. Trigger points activate chemicals responsible for sensitizing pain receptors. Acupuncture needles applied to trigger points have been found to decrease the presence of these pain receptor chemicals. This may explain the pain alleviation experienced by fibromyalgia patients receiving acupuncture, as demonstrated in various clinical studies, and in our St. Louis office. In one recent study, FMS patients receiving acupuncture had decreased pain and improvements in depression, anxiety, and quality of life. Our St. Louis chiropractors can relieve your fibromyalgia symptoms, enabling you to lead a healthier, pain-free life. Contact Accident & Pain Relief of St. Louis at (314) 588-9100 for an appointment today.